Of all e-cigarette brands, Cigarti electronic cigarettes are undoubtedly the most funky; they have the most attractive appearance with beautiful colorful skins you can change to fit your mood or the clothes you wear. You can personalize Cigarti further by adding a flavor of your choice. Cigarti cartridge is a one piece, self-contained unit that includes a built-in atomizer, nicotine/water solution and your choice of flavoring. Another plus are the long lasting batteries which are quickly and easily rechargeable. 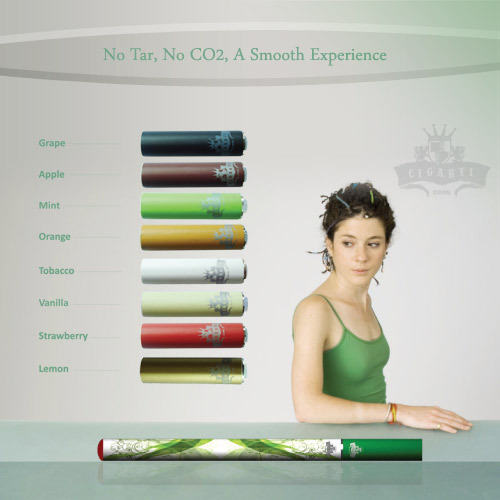 Like other e-cig brands, Cigarti uses clean water vapor and nicotine – without tobacco, tar, and carcinogens. Cigarti products are high quality and they offer one year guarantee on any item you buy from them.